Homeschool lesson planning saved our school year. Really. This past school year has been the hardest of my adult life. No one died, and for that I feel blessed. However, it was all we could do to make it through each day, and without a plan our homeschool would have been utterly lost for an entire year. As it was, we dropped classes, assignments, and whole weeks. Some weeks we doubled up on the schoolwork we decided to keep. Having a plan already in place made our choices easy. Last July my husband accepted his dream job training youth to join the workforce by arming them with a skill. The caveat? The job was 100 miles away, over a mountain range. Around the same time my husband became an instructor, we left our church of thirteen years. That was a terribly hard decision–one that came with many prayers and tears. We felt strongly that the Lord was moving us, so my boys and I worked hard to prepare our house of fifteen years for sale. The house sold in two weeks, we found the perfect home to purchase, and everything seemed to be going well aside from the loss of our church and many of our relationships. Then we had a code issue the city wanted us to fix. That code issue became a total nightmare–it cost us months of contracted work, tens of thousands of dollars, and many concessions with our buyers and sellers. After months of hard work we were able to secure proper permits from the city so we could close on our house, but until the day we passed the final inspection, everything was in the air. In the midst of that logistical mess, I had a terrible accident that nearly ended my life, and required months of recovery. God saved my life. I am certain of that. God led us through our housing issues and into our new home. He is faithful even when we are so, so weak. When we finally moved into our new home, I couldn’t lift a frying pan by myself, let alone pick up a box. I was in and out of the hospital and terribly fatigued. But we were home. We were all alive. Our family was finally all together again. Friends drove the 100 miles each way to help us clean and move in. The future looked brighter. Three weeks after we moved, my husband was fired. He shared the gospel at work, and was escorted from the premises. He’s now working 100 miles away–again. It’s been a hard year. Even so, I am convinced by Scripture that every event in our lives has been ordained by God for our sanctification and His glory. I trust He will work all things to the good of those who love Him and are called according to His purposes (Romans 8:28). I cling to that Scriptural truth. This past school year was a disaster. I was consumed by legal and logistical details. For months I was in agony (seven months, to be exact). And for six weeks after our move, I was deathly ill. YET, our boys were homeschooled this year. They completed their most important coursework, and they scored incredibly well on their required standardized tests. Both of my boys grew in character and in wisdom. It has been a joy to see. I’ve been planning out my homeschool years in advance for the past nine years. I find that the homeschool year is stressful enough without adding in weekly or quarterly planning as well. It takes me about two weeks of part time work to plan out a full year of assignments and procure the necessary supplies. I plan each week, then write the week numbers in erasable pen on each Sunday on my calendar. I make sure to schedule weeks off, but I find that my week numbers always move. There is always something that comes up, like illness sweeping through the house. Having each week’s number scheduled on my calendar makes it easy for me to make adjustments. I can easily erase the numbers and renumber my calendar. Sometimes we take two or three weeks to make it through a week’s worth of work. Sometimes we’re able to buckle down and catch up, studying two weeks in a one week period. Sometimes we just go a little further into the summer or shelve a subject until the following year. Having each week of our homeschool lesson planning done allows me to assess how we’re doing in perspective to the overall picture for the year. At the beginning of each school year I set our priorities–my goals for our household as well as for each child. When something goes terribly wrong, like it did this year, I know what we must keep and what we can afford to let go of. This year my boys dropped science and theology (which I need to actively teach), and took up horticulture, home economics, and shop. Those young men learned skills many adults haven’t explored. We were able to take eight weeks off at the beginning of the school year to prepare the house for sale and pack. When I was hospitalized and when I was at home in the worst agony of my life, they were able to consult the weekly schedule to stay on task with literature, English, history, Bible, and math. Had my kids been younger, we probably would have employed education videos and dropped even more of our coursework, but by middle school they’ve both become very self-sufficient. After we’d moved, we were able to double up on our curriculum to finish the entire year’s schedule on time. Though we dropped several classes, the boys are still in a strong position academically because those classes were optional at their ages, and because we’ve been on an academically challenging course. I think that even if that wasn’t the case, we’d still celebrate surviving the school year with some semblance of order. Both of my boys have developed independent devotional habits I’m blessed to see. It was a hard year, and our homeschool didn’t go the way I planned AT ALL. But because I planned, our homeschool survived and our boys thrived. We can plan our path, but we must hold those plans loosely. The Lord has ordained the events of our lives, and He will move us in the direction we must go. Proverbs 21:5 says: “The plans of the diligent lead surely to abundance, but everyone who is hasty comes only to poverty.” In homeschooling, let us be diligent with the lives of our children. You can make your own homeschool planner. In fact, I made my own with a spiral notebook for about seven years. Eventually, I wearied of the task of handwriting the same weekly structure over and over again. I made my own planner with three essential sections: Our Objectives Child-by-Child, Our Subjects and Supplies, and Our Plans Week-by-Week. I’ve incorporated the experience of helping students develop individualized education plans and nine years of homeschool planning to put together simple worksheets and schedules to help you plan your year. The Lord created each of us with a unique set of abilities and skills. As such, we’re not all going to plan the same way. I’ve included links to two more incredibly well-designed homeschool planning systems, each developed by women I highly respect. Take your time to look through all three systems and see if one of them will work for you! The Coloring design is by far the most popular, but I love the watercolored Rabbits and Coffee designs as well. Taking the time to set objectives for your homeschool and for each student is vital to staying on track throughout the year! The subjects and supplies section will help you determine what each child will learn. There are worksheets and schedules to help you choose curriculum and gather supplies as well. The final section of the planner helps you put together a weekly and a daily schedule for your family.Learn more: My Homeschool Planning Journal. 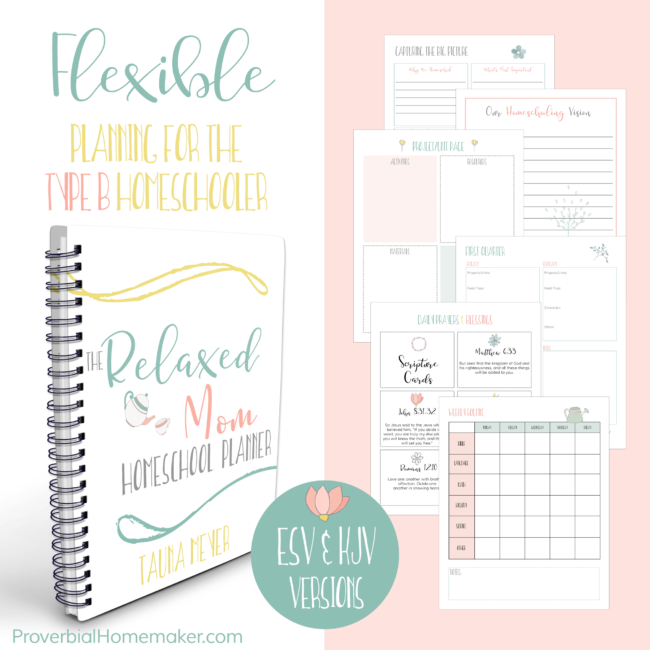 The Relaxed Mom Homeschool Planner and Course from Tauna Meyer at Proverbial Homemaker is a great option if you’re looking for a plan that’s more laid back. Tauna’s system comes with an ecourse and focuses on rhythms and routines rather than schedules. Record what you actually accomplish! Organize My Homeschool is a comprehensive plan with three levels of participation available from Kim Sorgius at Not Consumed. The system includes 5 in-depth modules of learning covering everything from setting a vision, establishing schedules and routines, organizing papers, and making excellent use of your homeschool space. Each module includes several short instructional videos in addition to the planning assignments and printables. I need to focus on the big picture and what we are trying to get out of homeschooling and record everything that we do get done. Thanks for the suggestions! Oh my goodness, Danika! That is quite a year! Can you imagine not having the Lord to help us through seasons like that? This post makes me feel even more that you and I are kindred spirits. 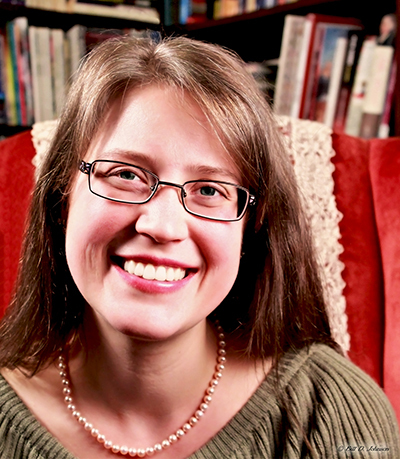 “I’ve been planning out my homeschool years in advance for the past nine years.” Yes. I love planning and I love how much easier our year goes when I have it all sketched out in advanced, knowing that some things will inevitably change but for the most part knowing what we would be doing in the months to come.